For some of us, spring training means a trip to the grapefruit league to watch our favorite baseball team gear up for the season. Since the beginning of the Occupy Wall Street movement last fall, spring training for political activists has meant getting ready to revive the Occupy movement, which has been a little low-key through the winter months. According to this piece in the Daily Record, the Occupy Wall Street movement is gearing up for a May 1st general strike. May 1st is also International Workers Day, which is celebrated as a national holiday in some 80 countries, but in the U.S. it is seen as a date of political organizing of significance to organized labor. “Spring training” for Occupiers preparing to rev up the Occupy movement and organize for a general strike will consist of training sessions for activists in 30 cities between April 9th and April 15th. 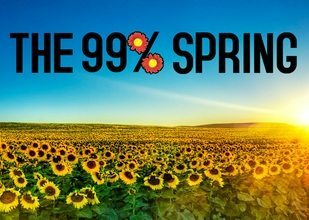 The training program is called the “99 Percent Spring.” Some of the training is being developed by the Communications Workers of America (CWA) and MoveOn.org will coordinate the entire effort of hundreds of workshop sessions. According to the CWA, 60 progressive organizations are participating and the turnout is anticipated to be 100,000. Some of this is clearly on the Occupy agenda, which has plans for “Shareholders’ Spring” protests at the shareholder meetings of 40 companies including Verizon, Wells Fargo, Chevron, and Bank of America. Student-led protests at Sallie Mae are also expected for its having profited from student loan debt.